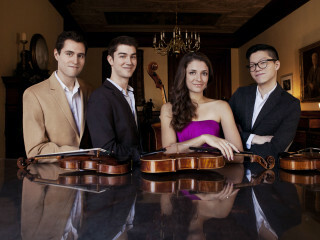 The Dover Quartet swept the 2013 Banff International String Quartet Competition, and they'll now perform a concert combining the glorious pastoral settings of Dvořák’s “American” quartet, the deep resonance of Berg’s String Quartet and Beethoven’s powerful “Razumovsky” Quartet No. 1. Dvořák, Quartet in F Major, Op. 96, "American"
Beethoven, Quartet in F Major, Op. 59, No. 1, "Razumovsky Quartets"